1) Provide all citizens with overalls, berets and a little red book by January 20th, noon sharp. Encourage beard growth. Discourage deodorant. 2) Convert the home entertainment aisle at all Wal-Mart’s into mosques. Holla, Allah! 3) Replace the name Jesus in the Bible with “GOBAMA ‘08”. 4) Promote gay marriage licenses on McDonald’s Dollar Menu. 5) Make abortion a requirement for a high-school diploma. 6) Stage a coup on Rush Limbaugh’s bank account and lather his wealth on food-stamping lay-abouts in need of methamphetamines and crack cocaine. 7) Ship Lou Dobbs off to work in a Honduran sweatshop. Deny him pants. 8) Turn off the electric fence at Gitmo, turn the prisoners loose and begin building a Six Flags amusement park in it’s place. 10) Bring the troops home, encourage them to take up pot smoking and offer them 40 acres and a mule. Yes, I think that covers the major points. If I’ve forgotten anything, let me know. The epic failure of the McCain campaign has one silver lining. The scary goblins he called his staff are ready to spill their guts about Sarah Palin. BARACK OBAMA IS OUR NEW PRESIDENT!!!!!!!!!!!!!!!!!!!! Election Day In The US - GOBAMA '08! Election Day is here! ELECTION DAY! George Bush can’t win! The Republicans are not going to rip us off again, not this time. Have you seen the lines? We’re in all the way for Barack Obama! YAY YAY YAY! Guess what? I live in Chicago, IL and my senator is running for president today. Maybe you’ve heard of him? Baby, is name is Barack Obama. Oh please, if you have not yet voted for him I must ask you to cast a ballot immediately. I am serious – get in line now. I will bring you food and water, and even hold your spot during bathrooms breaks. I’ll drive you wherever you need to go and vote. If you ask me to stop at the grocery store on the way home, I will say, “Sure! Would you like me to push the cart?” I am here for you. Wish us luck and GO VOTE AMERICA!!! Gobama like you mean it ’08! 1:55 AM - Dixville Notch, New Hampshire delivered a landslide for Obama. Obama 15, McCain 6, Ron Paul 2. I LOVE YOU. Dixville Notch voted for Republican George Bush twice in previous presidential elections. 6:05 PM CST - Obama takes Vermont with 3 votes, McCain takes Kentucky with 8. Still waiting on Indiana. For the first time in a gazillion years, Indiana has been unable to be the first state to report. People are still in line! 7:21 PM CST -Obama is up 77, to Mccain's 34. Let's get to 270! Come on PA, come on FL! Will conventional voting locations have more voting machines available on Election Day than early-voting locations? When I voted early a few weeks ago (county clerk's office), there were only 10 touch-screen machines available and I experienced a two-hour delay. Will "conventional" voting locations (high schools, fire halls) have more machines available, on November 4th, to handle the crowds? Please don't get me wrong. I am very moved to see millions of Americans lining up to vote - it's a brilliant time to be here in the US. 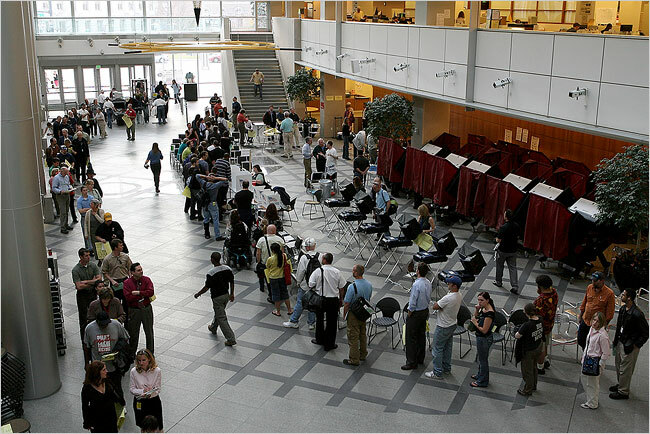 But still - long lines effect Democrats and Republicans alike, and it is not unreasonable to expect a more efficient means of voting for all citizens. Wasted time is just as much of a poll tax as an outright fee. I’m in a real pickle about this upcoming presidential election. If I say that Barack Obama is going to blow the barn doors off the thing, I will immediately be accused of jinxing Obama and screwing up everything. The people I know and the pundits on TV are all aware that Obama is ahead in the polls, but no one wants to jump the gun and just say it. Heck, I’m a bit scared myself. The 24-hour news cycles have me prepared for a political catastrophe of indescribable origin, by staging scenarios in which John McCain could suddenly pull ahead. No one knows what fate has planned (accept for most pollsters), but there is a vague possibility of frozen Hell and bird-pigs soaring over our heads - or so I am told. It seems unreasonable to me, but I get the impression from cable news people that I shouldn’t count Grampy out. Why not? What if Obama wins? I know it’s crazy to expect a guy so far ahead in national polls to actually win the contest, but what if Obama can do it? Someone has to plan for victory here, just in case. The only thing holding me back from being overly optimistic is one man: George W. Bush. Twice we gave him the keys to our country, our just washed and waxed country with a full tank of gas. The first time out he drove us into a ditch. The second time he drove the ditch off a cliff. You would think we Americans might have been wiser the second time, and obviously there is something wrong with us. People in this country are capable of screwing up and I thank Blind Justice Lady everyday because George W., by law, can’t have a third term. That is to say, unless McCain wins. Then the US would go to places only Dante has been. And believe me when I say Dante knows of Hell. On the other hand, for the first time ever in the US, early voters are making a clear case for Obama. They seem to be coming out from all corners to stand in line – sometimes for several hours. Most of them are Democrats. None of them are afraid to dream. Even for a small while – as long as it takes to refocus their eyes. I am telling you right now, my house is going to be noisy Tuesday night.